This June the Japanese beetles made their way to our yard. (They are not really June bugs, but they arrive in June in my world.) And of course, we have much for them to munch on as our greenhouse is still in reconstruction. These shiny metallic looking green bugs seem to love our basil, and tasted the hydrangeas, geraniums, and hibiscus. We are thankful as the plants’ temporary home, our green screen house seems to capture the little critters. And while they mate on the screen, we capture them into jars that become their coffins. Dean & I seem to have conquered this bug invasion, but are on guard everyday, morning and night for the next couple of weeks. Beware! My identical twin sister and I are close in many ways. Of course, we are close in age. But our looks, height, weight, markings, hair color, skin color, etc are very close as well. Those young childhood years we were instant playmates. Though during the junior and senior high school years we developed our own interests and friendships. So many personality traits are different. Yet we share a common interest in organic gardening, art, and the simplicity in living as mature adults. There is a close, understood bond with twins. And as we get older, this rings true in our relationship. 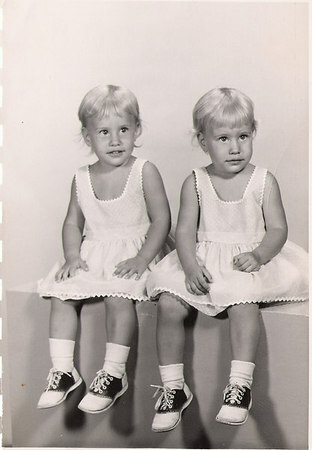 Here we are, my twin sister Margie & I at age 2. I would love to hear your twin story. I dedicate this post to my Aunt Shirley & Uncle Lee, childhood sweethearts and best friends for life. They were married 50 years ago in May. The 1st photo displays the fun loving couple I will always remember in my heart, and their friends and family. 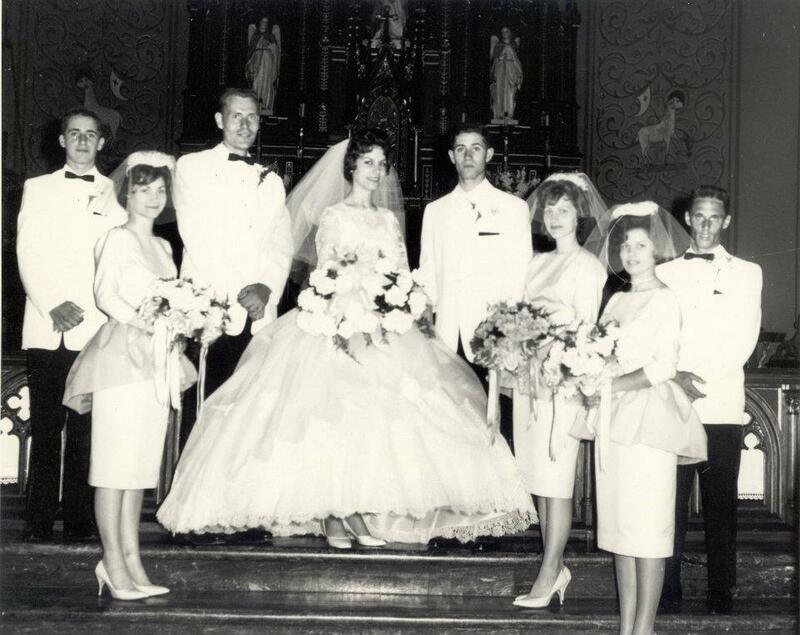 Included are my father (to the left of the bride) and my mother (to the right of the groom). 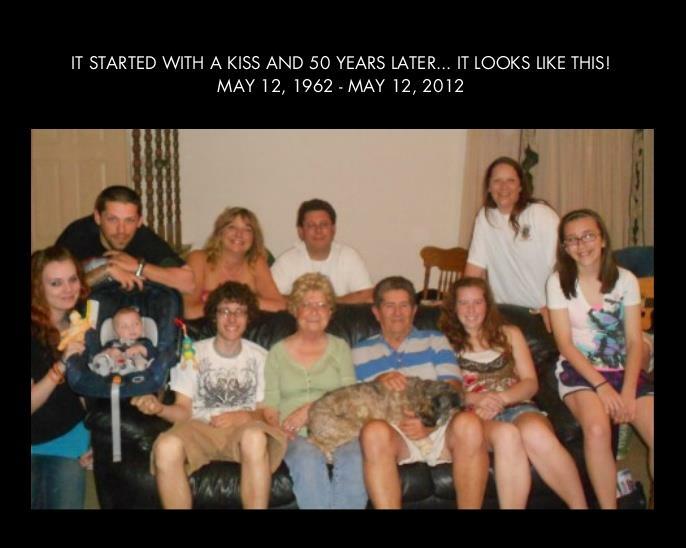 The 2nd photo is at their 50th wedding anniversary celebration with their children and grandchildren. We lost dear Aunt Shirley on June 6 after many months of battling lung cancer, she died from a seizure. I love you, Aunt Shirley and Uncle Lee. The ambiance and local menu tonight was colorful. My huge kitchen is decorated with vases of our cut flowers and the fireplace mantle is overcome by beautiful blue hydrangeas from my parents’ yard. Dean & I’s dinner plates were filled with roasted spring root veggies and beef farm fresh by friends who allow their cattle to graze in their farm’s natural pastureland. I sit on my patio listening to the evening chatter of the birds and crickets until the summer night sky is dotted with fire flies. I needed some beauty in my life today. My feline companions bat at the moth and June bug on the patio screen hoping to get a hold of them. Celine and Lily will need to stay inside as the neighborhood Great Horned owl visits our tall backyard maple tree some evenings. This may be one of those evenings. We protect our animals from harm with barriers like screen doors. Maybe similar to how our God sets up boundaries for us. I take in the beauty of our green friends, the plants we care for everyday. Tonight I will not water or trim or plant. I will sit and enjoy the greenery. They endured the sudden hail storm yesterday. Our elephant ear , banana trees, and birds of paradise have ripped leaves now. These plants will come through after some shedding. Is not life like that? 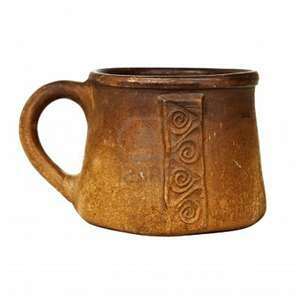 We get hammered by hard blows, unwarrantly and needlessly. Yet, we rise again to be ourselves, probably better people for it if we allow. Thank you God for the beauty my eyes behold tonight, and the reminder that the heart heals. I work in the county seat of Clayton, Missouri, the hub for many financial institutions, businesses, and the government offices for St. Louis County. Every morning when I arrive next to the Police Headquarters building, a peregrine falcon calls from the Commerce Bank building, which is at least 20 stories high. It is a destinct call, and it echos between the other tall skyscrapers. Today was no exception. Although I appreciate the photo of the week challenge, to take a photo of this peregrine falcon would show up as a speck in the photo as I do not have a zoom lens. I cannot enter the rooftop of the bank building. 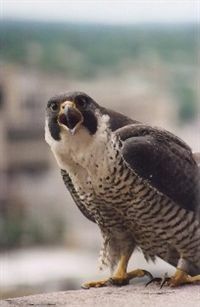 I am sharing an online photo of a peregrine falcon found on the city hall and courthouse in Minneapolis. I have yet to see this falcon and his companion up close other than through binoculars. I see remnants of where they have been, torn feathered wings of pigeons along the sidewalks and on top of my 5-story building. Someday I may witness an attack in flight. Until then, I enjoy the echos of their calls to each other. They seem to need each other.